This is an account of one of our family’s best days last year. Father’s Day is a glorious all-day event in my home. So committed is my trio of kids and spouse to making it special, they eagerly celebrated it with me a week in advance. Of course an epic adventure was in order. The plan was to introduce the family to the Munger Trail, anticipating some easy family biking down the smooth gentle grade descending through and along rock cuts toward our jewel of a city. Also on tap was a pit stop to find the abandoned railway tunnel that lies just above the Munger, and a potential climb to the top of Ely’s Peak. As with most of my adventures, this one was a bit epic for our reality. The first major curveball was the closure of Beck’s Road. We drove endlessly in detour, and finally down the gravel terminus of Skyline Parkway. Wouldn’t you know it, but the darn thing ends exactly at the start of construction on Beck’s Road! I did, however, observe a wood railroad bridge that spanned this part of the nearly unused road. 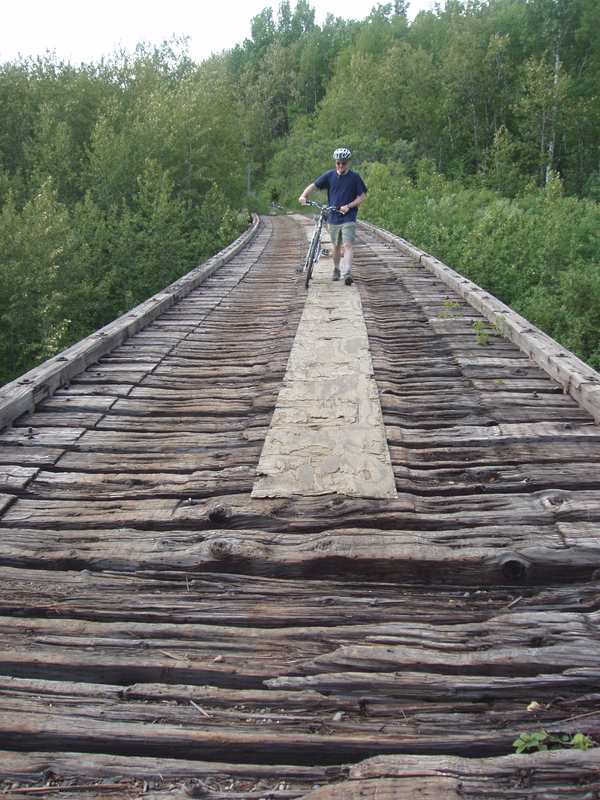 Clearly this had to be the abandoned railway line from the Duluth, Winnipeg, and Pacific Railway. Thoroughly frustrated, yet determined to cram in an exciting family adventure into what was fast becoming a waste of a day, I hustled all our bikes up to the dusty trail that was formerly the first rail line to Duluth. This was not ideal biking for small kids. It was dusty, sandy in spots, and had rocks in places that made biking difficult. The trail was in rough shape and completely unmaintained. With temperatures hitting 90 degrees, and a constant downhill grade that would need to be returned on, we had a recipe for a hellish day. Ten minutes after gaining our bearings on the abandoned trail in the middle of nowhere, I heard the impossible sound of an engine approaching. It was an old pickup carrying Cletus and his girlfriend as the vehicle was scraped by hundreds of small trees growing on the edges of the trail. Fearing a possible Deliverance situation I backed the kids away, and was relieved to find a nice smile on the country boy’s face who was trying to go around the construction. The visit was fortuitous, because he confirmed that my gamble was correct. The old rail bed would carry us to the tunnel. We then faced a seemingly insurmountable obstacle. An ancient trestle crossed a large gorge, which seemed to span the horizon. It looked worthy of the Hogwarts Express, and appeared to lead to Middle Earth itself. Following a long deliberation, we decided to walk the kids over the well-built structure hand-in-hand since plywood was laid down the middle by apparent bikers or well meaning dwarves. Mere minutes later we reached the tunnel, which was drilled and blasted 520 feet through the hard rock that makes the heart of Ely’s Peak. 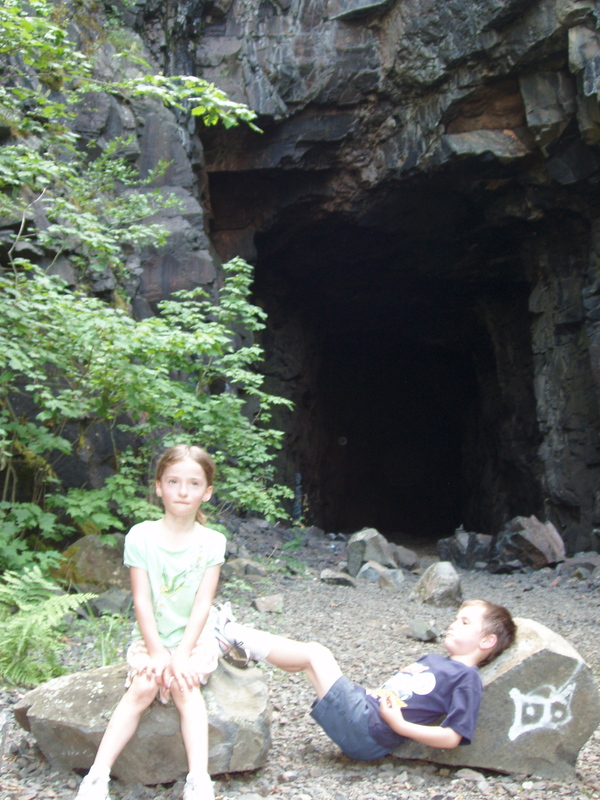 My kids donned head lamps and embraced their first spelunking experience with gusto. 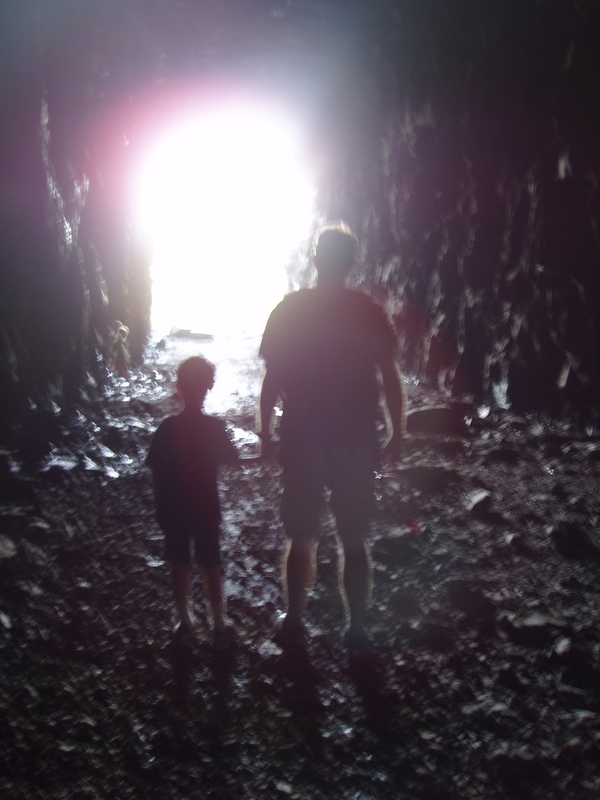 It was cool and dark in the tunnel as it curved along, and a welcome breeze wafted through in memory of the steam engines that hauled ore through it 100 years ago. Reaching the other side we were pleasantly surprised to discover that the lake side of the peak was significantly cooler than the inland side. All we had for sustenance was some ancient horehound candy mined from a secret compartment in the car, and we turned back up the hot dusty uphill grade around the time of our usual supper. We easily took a dozen breaks during our climb back to the car, and one of our children spent a “contemplative” moment weeping in the hot discouraging dust. By comparison, the Superior Hiking Trail seemed infinitely more inviting as it descended from our hot plateau into a cool valley full of thigh high lush ferns. Eventually we got our bearings back, and I was so proud of our kids as they pedaled up the steady grade all the way back to the car. More importantly, they were proud of themselves, and learned they can conquer tall obstacles with teamwork and perseverance. 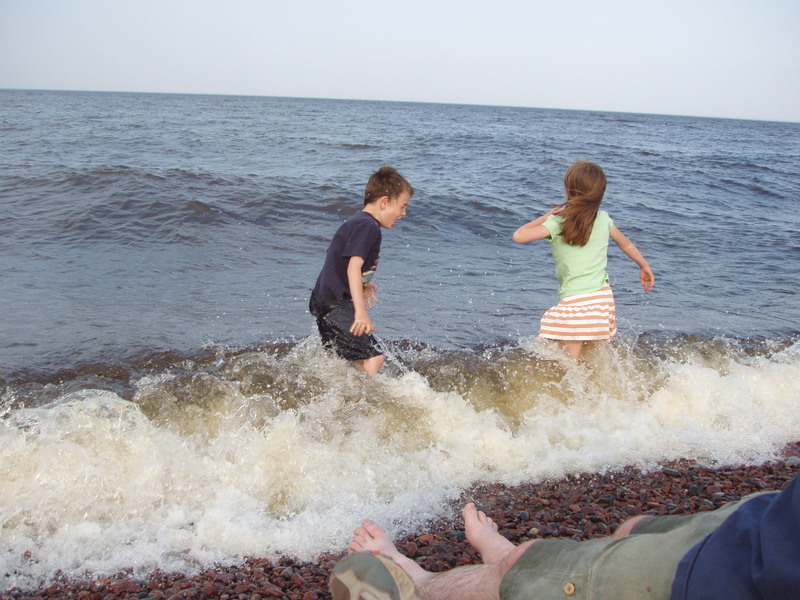 That night we enjoyed an ice cream treat and the most refreshing swim in Lake Superior of all time as the dust succumbed to the cleansing power of the largest lake in the world. The entire trip had been a trial fit for the ages, but somehow the sum of the parts made for an experience that will forever be lodged in our memories along with the greatest experiences of our lives.